Mental stimulation can prevent anxiety and destructive behaviours in bored dogs. Every dog has a different way of processing boredom and a lack of stimulation, and most pets need a variety of routine activities to avoid the undesirable behaviours that result. In this article, we are going to look at some of the common signs of bored behaviours and how to prevent destructive habits. Identifying symptoms of dog boredom is pretty easy, but knowing which boredom solution will be effective for your dog may require some trial and error. Many of these symptoms can be related to other issues, like separation anxiety, poor socialization and even illness, but a good starting point is to keep your dog mentally stimulated. Here is a list of some of the most commonly seen signs that your dog is bored to tears. Some signs are more noticeable than others, like destructive chewing. This one tends to affect us the most because the things that they are chewing are often ours... and expensive. Besides being a nuisance, this can be dangerous. Pets eating non-edible materials can cause digestive upsets, blockages and present a choking hazard. Your puppy nibbling on your fingers may be cute, but if your pup were to chew through a cord, there is a much greater risk of harm. Of course, this is very concerning, and putting a stop to destructive chewing should be a top priority. Pacing, barking and marking can be signs of anxiety, but can also be a way for your pet to act out or get attention. This is a good indicator that they might need a hobby. Of course by hobby, we mean that you need to provide both mental and physical stimulation to allow your dog to feel satisfied with their daily activities. Some less seen, but concerning signs of boredom include poor or inconsistent eating and sleeping habits, as well as rapid changes in energy levels. Just like us, if your dog is bored, they may eat or sleep more, which can lead to weight gain and muscle loss. Regular and routine activities can help prevent this and allow your pet to have a lifestyle that is synchronized better with your schedule. Aggression is rare, but it can be a symptom that your pet is needing something to do. Aggression can come out during playtime with you, your kids, or other animals, and seeing warning signs of aggression can be difficult to spot. 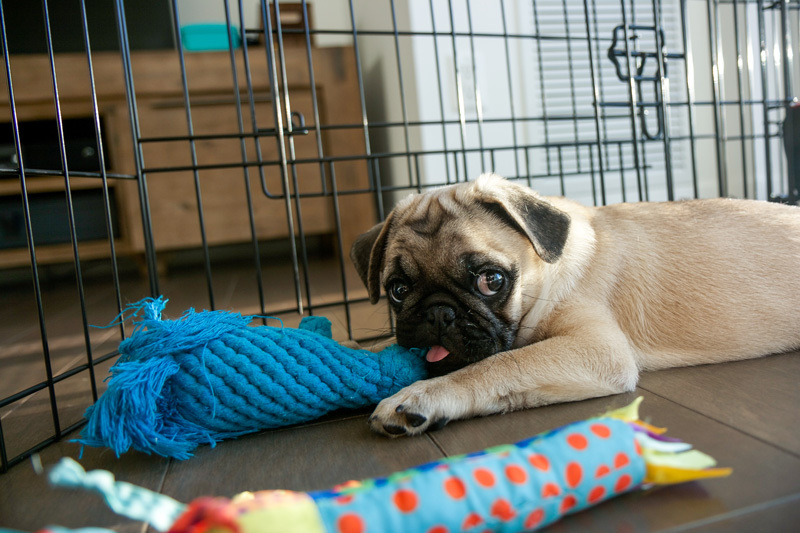 You can’t blame your pet for getting a bit grouchy when they spend all day doing nothing, idle hands and all, but you can enrich his routine and allow him to use that pent up energy for something productive and enjoyable. A lot of bad things can happen when your dog is under-stimulated, fortunately, building a consistent routine is actually pretty simple once you determine what your dog likes to do. That may sound a bit silly, and I am not overlooking the fact that we have a tendency to humanize our pets, but they do have preferences when it comes to activities. They could prefer mind games or puzzle to group play, or even games requiring physical agility. Stimulation can be broken down into two categories, physical and mental, and both are very necessary in order to provide a stable routine for your dog. We all know that ‘physical stimulation’ is just another way to say ‘exercise’- that thing we all hate to do. But exercise for your pet doesn’t need to be difficult and definitely doesn’t need to involve expensive equipment or a gym membership. Although, you have to admit, a doggie gym would probably be the cutest thing ever. Depending on your dog's abilities, body condition score, energy levels and mobility, exercise can range from simple activities like daily walks around the neighbourhood to more advanced exercise like agility sports. For more information, check out this article about the importance of exercising your dog. We always appreciate ambition and goals, but start small and work up to grander ambitions instead of pushing your dog too hard right at the beginning. This way you can see what your dog is capable of and avoid athletic injuries from overworking their previously inactive joints. Diet, of course, plays a role in how your dog exerts energy, so understand that increasing energy may mean increasing portions, or switching to a more protein or fat dense food. For overweight pets, it may not require dietary changes, but you should be regularly monitoring your pet's weight as they increase activity. For more information about weight management, check out Weight Loss Dog Food: Managing Your Dog’s Weight. Fetch, the beloved classic game for you and your pet. Fetch is a great way to encourage continuously active play in short periods. A five minute game of fetch for you may not seem too strenuous, but for your dog, especially prey-driven dogs, fetch can be intense. On top of that, fetch helps you strengthen your bond with little Fido. If you show excitement for the game, then your dog will be more excited about including you in play time. Daily walking or running with your dog is a great way to relieve both stress and boredom. Regardless of your pace, this outing is both great exercise and an adventure for you and your pet. Getting out of the house or familiar territory will allow your dog to explore the world in a safe and controlled manner. It provides opportunity for socialization with people, dogs and wildlife, and it will help your dog understand their boundaries. Plus, this is an activity you would do together, which provides some much needed one-on-one stimulation and bonding for you and your pup. Flirt poles can be another excellent exercise technique for prey driven and high energy dogs. Flirt poles can be found at many pet stores, but they are pretty simple to make yourself if you want something a little more cost effective. It may not be as durable, but your dog will not care. Flirt poles are a great way of expending large quantities of energy in a smaller area, like your backyard. The idea is to encourage your dog to catch the “prey” at the end of the rope, but don’t make it easy for them, spin, lift or flick the toy out of reach to increase your dog’s activity. To end the game, make sure you let your dog catch the prey and give them lots of praise for a job well done. This method isn’t ideal for low energy pets or dogs with limited mobility. Remember to start small to determine what your dog is capable of. Use what you have to create fun indoor activities. 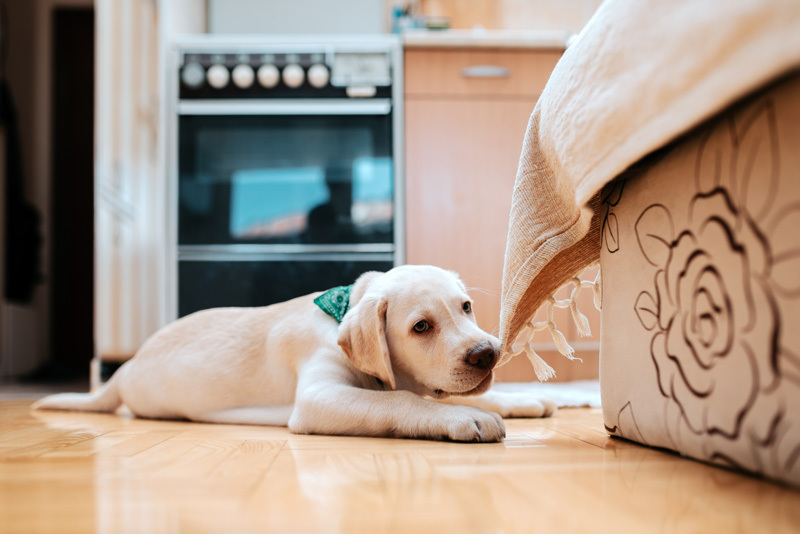 Creating an obstacle course using furniture and pillows or running your dog up and down the stairs is a great way to help your pup work out on cold or rainy days. Check out this blog for some simple and fun ideas for building your own DIY dog obstacle course. Slower paced games of indoor fetch are a great way to use the stairs, but make sure that it is safe. Carpeted stairs provide more traction for your dog and will prevent injuries and slipping. Always take precautions when playing indoors. Move furniture or obstacles that may be in your pets running path. It will avoid injury but also prevent damage to your house. For more ideas to increase your dog’s physical activity levels, check out 10 Ways to Exercise with Your Dog. Exercise is vital to a happy and healthy lifestyle, but exercising their minds is just as important as exercising their bodies. Keeping your dog mentally stimulated will not only keep them out of trouble, but it will also help them develop and learn. Mental stimulation can be achieved through a variety of methods from beginner to advanced, and starting a consistent mental activity routine will be exciting for both you and your pet. Mental activities will also help reduce excess energy, so it’s great for days when outdoor exercise is not an option. 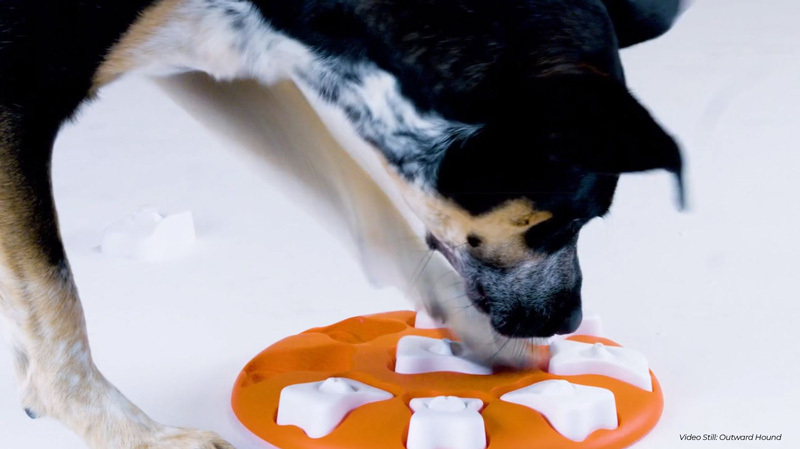 Many toys are made to keep your dog thinking and motivated by incorporating food or treats. This is a simple way of providing mental stimulation with an immediate reward for solving the puzzle. Some puzzle toys are made for beginners, and usually, require one or two simple actions to uncover the reward. For dogs that have used puzzle toys before, or if they figure out the trick too quickly, you may want to look for a puzzle toy that is marked as 'advanced'. These toys usually require more coordination and logic skills to get to the treats. They often can’t be nudged or shaken to loosen the treat; instead they must be turned, pressed or pulled to unlock the prize. Treat balls are another form of puzzle toy, and although they are not typically very complicated, they can hold a larger quantity of treats allowing for longer play time. The Kong Wobbler, for example, is weighted on the bottom, requiring a repetitive motion to get the treats out one at a time. Puzzle toys are ideal for indoor play and are a great way to teach vocal commands like paw, touch or push. It’s also a great game for quieter play. Early in the morning, or later in the evening when the house is winding down, puzzle toys can be a quiet and easy way to tire out your pup to get ready for bed or alone time. While no toy is truly indestructible, there are some pretty close contenders. Chew toys are not edible, but they are meant to be durable enough for rougher play, tug or fetch. Check out our blog on some of the most durable chew toys for extreme chewers for some recommendations. Always monitor your dog with chew toys, as the materials are not meant to be ingested. If a chew toy is damaged, remove the toy immediately. A good way to keep your dog interested in their chew toys is to rotate them frequently. After a few days or a week of playing with one toy, remove the toy, and replace it with a new one. Continue to rotate your toys so that your dog is always excited to see them. In addition, rotation will help to prolong the life of the toys. To replace the habit of destructive chewing, offering long-lasting edible chews are a great way to curb bad behaviours. They satisfy the need to chew, promote better dental health as well as occupy their time. Not all chews are right for every dog so never leave your dog unattended with something that could be a choking hazard. Find a chew that is appropriately sized and is tough enough not to be broken up and swallowed in large chunks. To provide a challenge, offer different types of chews routinely. Switching up the shape and texture of chews will prevent your dog from figuring out how to demolish them as quickly as possible. Many dogs learn to hold the chew a certain way with their paws so that they can get more leverage with their bite. Changing up your chews will help prevent this familiarity and help each variety last longer. Some chews are better for frequent mental stimulation, while some should be fed more sporadically. Make sure you understand the calories in each type of chew. Effective natural chews tend to be larger, so it’s good to remember that they are contributing to daily calorie intake. For pets with weight problems, look for lower fat chews and feed in moderation. More nutritious chews can be used to supplement their regular diet, like raw bones, so take those calories into account and adjust the days feeding accordingly. Treats shouldn’t take up more than 10% of the daily diet, so for many dogs, feeding large chews daily may be too much. For this reason, chews are not a perfect solution to curbing destructive behaviours but can be used in combination with other activities to help provide a complete exercise routine for your pet. There are lots of puzzle toys on the market, but just like chews, they should be rotated to allow for variety. This can get pretty expensive. Try rotating in some of these cool DIY puzzle games to help keep your dog entertained on a budget. For more ideas, check out our blog, Does your dog eat too fast? : Side effects & solutions. I’m sure we’ve all seen this as a classic busker routine. 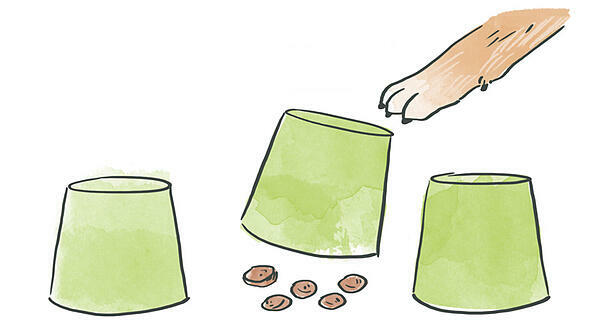 Put a ball under one of three cups, shuffle the cups around and guess which cup the ball is under, except for your dog you’ll be using treats instead of a ball bearing! It’s a great way to help your dog learn to pay attention and wait for the right time to act, being prompted by vocal or hand commands. It seems simple enough, but it will take some practice for your dog to understand the sequence of events in this game. It’s not necessary to ask your dog to lift the cups, but just to identify either with his paw or his nose which cup the ball is under. If he guesses wrong, show him and let him try again. If he guesses right, then he gets to eat the reward under the cup. You can up the ante for this game by associating words with different quantities of treats. Like big or small, or more or less. In this case, you would put a treat under one cup and many treats under another. Always make sure that your dog sees which cup the treats are under before you start shuffling them. Then just specify which grouping of treats that you want them to identify. This is a more advanced level technique, but it is ideal for dogs that have mastered the basics of the shell game. Plastic bottles can be re-purposed to make a fun game for your pet. This method requires minimal effort and zero cost to you, so it's worth a try. Grab a water bottle, or juice jug, remove the labels and clean the container thoroughly. Cut a few holes, fill it with treats and screw the cap back on. Your dog will chase and bat the bottle around to knock some of the treats out. Empty cardboard boxes can also be used to hide treats, but make sure that they are not eating the cardboard. Be prepared to take the “toy” away if your dog is starting to tear it apart. This is another basic level puzzle, but it’s a great way to teach your dog to use their noggins to figure out how to get the reward. Get a regular sized muffin tin and 3-5 tennis balls (or more if you’d like). 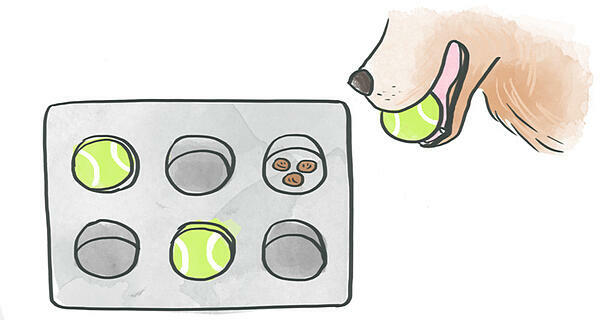 Place some of your dog's favourite treats in the muffin tin and cover them with the tennis balls. Your dog will have to pick up the tennis ball and drop it to get the goodies. For small and toy breed dogs, this may be trickier, unless you have smaller tennis balls, like the Kong Squeaker tennis balls, and a mini muffin tin. Remember to use a treat that will keep your dogs focused. Strongly scented treats like fish or meat are best to accomplish this. To take this game to the next level, you can keep some treats aside and ask your dog to place the tennis balls back into the tin. It doesn’t have to be perfect, but you want your dog to try to get as close to the hole that you are pointing to as they can. When they succeed, reward them with another treat. Dogs can learn approximately 160 words. Beyond basic commands like sit, shake and stay, that leaves a lot of options for word association. A popular version of this is to teach your dog the names of his toys. This is a great way to make a game within a game. Before playing fetch, you can teach your dog the word ball. Then ask them to grab their ball and reward them when they pick the right toy. Or come up with simple fun names for the toys, like Steve or Mike. Keep the words small and simple to start and make sure you always choose new names for new toys to prevent confusion. Did you know that dogs can count too? Again keep it simple by using larger treats or toys and teach them 1, 2 and 3. Once your dog has mastered this, you now have a new game. Hold a single treat in one hand and three treats in another and ask your dog to pick the hand with three treats. Follow the correct choice up with another treat or lots of verbal praise. This is another simple game, and you can change it up by using any toys, treats, or simply yourself for a more classic version of hide and seek. Ask your dog to sit and then show him the reward. Let him smell it too because dogs hunt by scent. Then sneakily hide the treat or toy somewhere in the room. Try not to be too obvious, but don’t make it too complicated either. 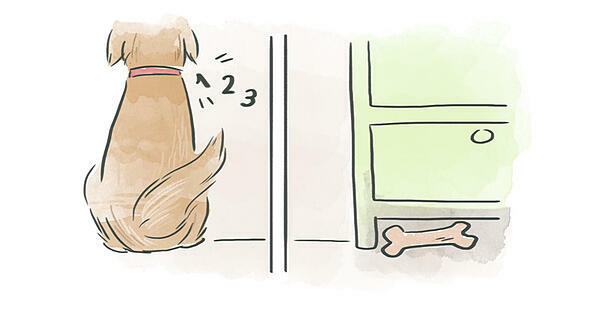 Start by hiding the prize under a blanket, or around a corner, while your dog is in a stay position. When you are ready, say search, find or some other word that will let him know it’s time to hunt. Once your dog has gotten a knack for the game, start choosing more difficult hiding places, like harder to reach areas or a spot in another room where they will have no idea where to begin their search. If you decide to play without a treat or toy, then you can simply hide around a corner, in another room, or behind furniture and let your dog come find you. To incorporate some word association into hide and seek, you can teach the words hot and cold. Just like we used to play when we were kids, say hot when your dog is getting closer to the reward and cold when they get farther away. This technique is especially great for outdoor hide and seek where the hiding places are more challenging. A method that may be available to you is groups or organizations that offer classes or get-togethers to help train more advanced mental stimulation techniques. These are great for any dog, but are extremely beneficial for high energy dogs that need extra activities to wear them out. Agility classes, scent detection, lure coursing and flyball are all great ways for your dog to stay active and social. These options are less frequent than the other methods mentioned, usually weekly or bi-weekly, but they are perfect for anyone looking for extra-curricular activities for their dog. See what is available near you, or try to make your own. Obstacle courses can be made in your backyard using scrap wood, old tires, hula hoops or other common items. Scent detection can be accomplished using essential oils or strong smelling food. Scent detection works best with particular vocal or hand commands and can be easily converted into a more advanced game. Teaching your dog to identify when they’ve found the scent with an action, like paw or sit, is a fun way to make scent detection more challenging. Many of these activities require a certain amount of training and preparation and are often best for more active or energetic dogs, but that doesn’t mean that lower energy or senior dogs can’t participate. It just means that you may need to ease them into these games by starting with shorter sessions or easier targets to help them build the stamina and coordination required. Many pets show destructive behaviours when they are left to their own devices. This could be while you're at work, while you're asleep or even the ten minutes that you are in the shower. This can be related to separation anxiety in dogs and cats, but is often simply a sign of boredom or under-stimulation. Teaching your pet how to keep themselves occupied while they are alone will significantly reduce their negative behaviours. Take some time to show them safe and appropriate activities that they can do by all by themselves. Toys and chews can be an option as long as you choose ones that you know aren’t a potentially choking hazard. One of my favourites for dogs is a stuffed Kong or similar style of toy. This is a durable rubber toy that can be stuffed with a dog-safe peanut butter, or food that is both delicious and difficult to get out. Another option is to freeze broth or canned food in a toy for a longer lasting reward and a refreshing treat in the summer. Your pet wants to spend time with you. This means it is important to set aside time with them every day. 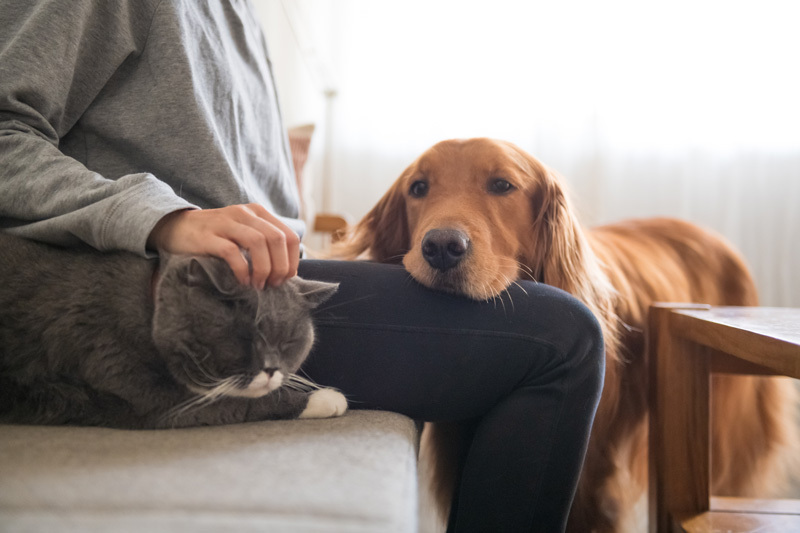 Simple games and even small amounts of attention show your pet that they are a priority in your life, and in regards to destructive behaviors, that bit of time goes a long way. Even a simple couch cuddle or some belly rubs while you're relaxing in the evening can be a bonding experience. Find regular activities that you can do together. If you have more than one pet, it’s very important to spend time with them one-on-one. Some pet siblings are bonded and don’t mind group hangouts, but many pets want mom and dad all to themselves sometimes. The fuller your house is, the more likely it is that your pet may need to mommy/kitty time. Now that you have the tools to help revive your pet’s activity routine, it’s time to jump in. There is no single right choice for any pet, so take the time to test out a few of these methods to find out how you can engage your pet more. By using a variety of stimulating methods, your pet will feel loved, energized, and stay both physically and mentally stimulated in their environment- ultimately leading to a reduction of undesired behaviours and annoying habits. Our pets need structure and routine, so working their exercise routines into your daily schedule will not only make your pet happier, but also healthier. 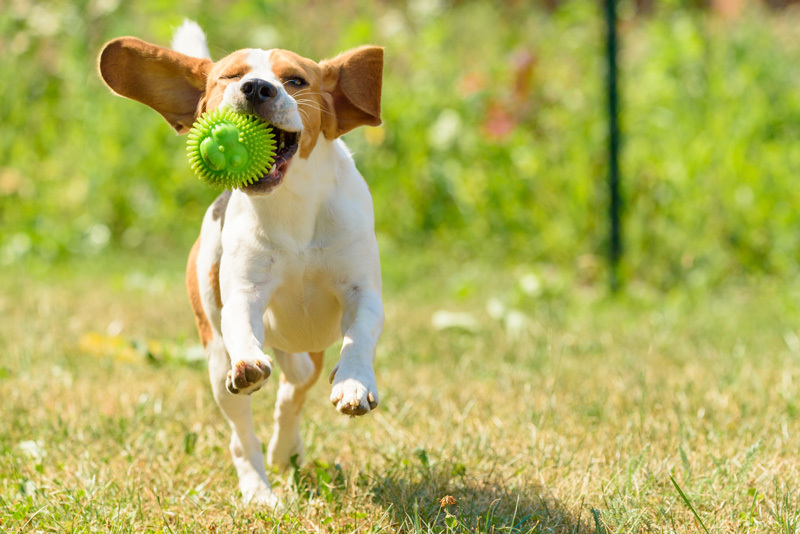 Weight management, anxiety and even mobility issues are worsened by sedentary boring lifestyles, so always opt for additional playtime in whatever manner is most appropriate for you and your pet. It’s critical to remember not to expect immediate results. As with any lifestyle change, time and patience are required while you transition to a new routine. Some games and activities may be too intense or too complicated for beginners, so you may find your pet getting frustrated with a game of hide and seek or a challenging puzzle toy. Try not to get frustrated or angry with your pet. Instead, break the game down to simpler components or just try an easier game. For an activity to provide value, it should be challenging but accessible and fulfilling. Don’t set impossible goals, instead choose ambitious goals that are attainable and fun. In time your pet will be better behaved and happier in their environment. We want to here about fun ways that you keep your pet entertained and mentally active. Let us know in the comments below!